"RECOVERING, REBUILDING AND RESTORING OUR NATIONS' INFRASTRUCTURE." The program cover future and prospective projects during all open public meetings. Open for Comments and Suggestions for 30 days after each public meeting. Purpose – Maintenance of BIA Contract Agreement Routes within the NTTFI – BIA Owned routes and facilities only. Purpose -clearly demonstrate a tribe's transportation needs and to fulfill tribal goals by developing strategies to meet transportation needs. These strategies address current and future land use, economic development, traffic demand, public safety, health, and social needs. Future project Planning through Traffic studies, Safety studies, Road Maintenance studies and trending Transportation studies. Purpose - Planning and design of Tribal Transportation Facilities. • Engineering support studies (i.e. geotechnical, hydraulic, etc.) • Environmental studies, evaluations, and compliance activities. • Planning and design of mitigation for impacts to environmental resources (i.e. wildlife and their habitat, wetlands, cultural resources, water quality, air quality, etc.). • Architectural and landscape engineering services including lighting. • Inspection of bridges and structures. • Public meetings and public involvement activities. • Tribal employment rights ordinance (TERO) fees. Purpose - Construction, reconstruction, rehabilitation, resurfacing, restoration, and operational improvements of TTP facilities (i.e. roads, trails, bridges, structures, pedestrian and bicycle facilities, transit facilities, ferry facilities, rest areas, parking areas, etc.). • Road sealing and chip sealing. • Americans with Disabilities Act (ADA) improvements. • Seasonal transportation routes including, but not limited to, snowmobile trails, ice roads, and overland winter roads. • Mitigation activities required by Tribal, state, or Federal regulatory agencies, and 42 U.S.C. § 4321 et seq., The National Environmental Policy Act (NEPA) (see 25 CFR Part 170 Appendix A to Subpart B for other environmental related allowable costs). Purpose – This program directive is in place to Supplement the Road Maintenance TPA(BIA 638 Program) with rehabilitation, resurfacing, restoration, and operational improvements of TTP facilities (i.e. roads, trails, bridges, structures, pedestrian and bicycle facilities, transit facilities, ferry facilities, rest areas, parking areas, etc.). • Road sealing and chip sealing. • Americans with Disabilities Act (ADA) improvements. • Seasonal transportation routes including, but not limited to, snowmobile trails, ice roads, and overland winter roads. • Mitigation activities required by Tribal, state, or Federal regulatory agencies, and 42 U.S.C. § 4321 et seq., The National Environmental Policy Act (NEPA) (see 25 CFR Part 170 Appendix A to Subpart B for other environmental related allowable costs). 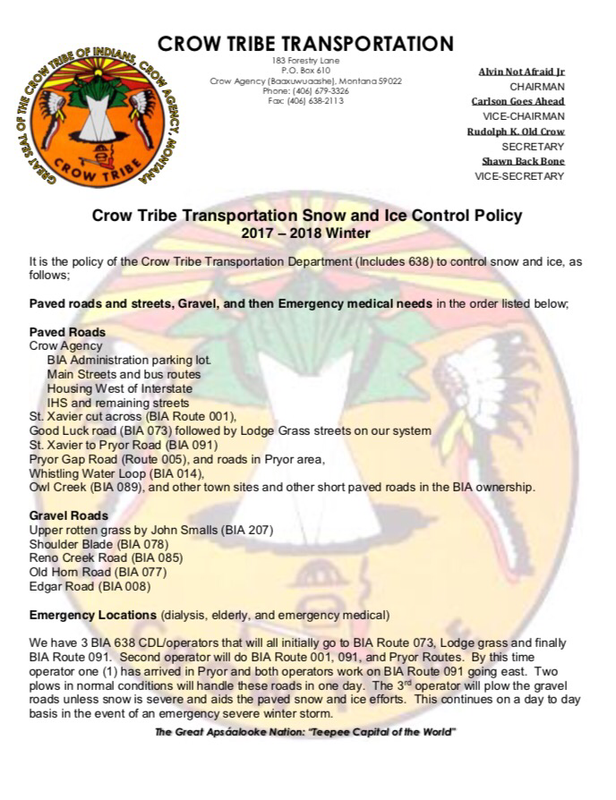 Tribally Owned Routes and Routes within our current NTTFI – National Tribal Transportation Facilities Inventory. Purpose – This set-aside grant comes from the overall TTP funding – as a supplemental grant to supplement the FTA and State Federal Transit Program for the Tribal Needs. Purpose - Each year under the FAST Act, 2% of the available TTP funds are set aside to address transportation safety issues in Native America. Funds are available to federally recognized Indian tribes through a competitive, discretionary program. Awarded annually, projects are chosen whose outcomes will address the prevention and reduction of death or serious injuries in transportation related incidents, such as motor vehicle crashes. Transportation fatalities and injuries severely impact the quality of life in Indian country. Statistics are consistently higher than the rest of the nation as a whole; FHWA advocates the development of strategic Transportation Safety Plans as a means for tribes to determine how transportation safety needs will be addressed in and around tribal communities. Each year since 2015 we have applied for TTPSF Grants. Currently we have a $306,000 – grant to design, construct and maintain a Walkpath – Crow Agency Head Start Pathway. Awarded FY17 – To be Completed FY18.